Dopplr, the online tool that allows frequent travellers to share their travel schedule with friends, has launched new Dopplr City Pages. 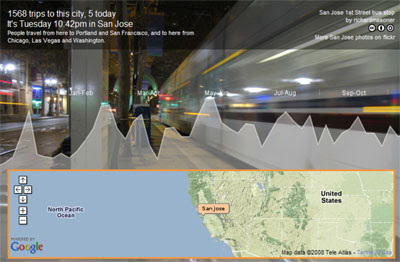 The new Dopplr City Pages are a collection of information and tips for cities throughout the world. The pages also provide some cool statistics of visits by Dopplr members to each city. The city page includes a Google Map showing the location of the city and above the map a graph showing the number of visits to the city over the last year and how many Dopplr members are in the city today. The graphs of yearly visits are overlaid on some cool photographs of each city so each city page looks pretty spectacular. The tips are pretty useful as well.